Methods: The compounds were subjected to DFT calculations in order to obtain quantum chemical molecular descriptors. Multiple linear regression algorithms were applied to construct QSAR models. Separation of the compounds into training and test sets was accomplished using Kennard-Stone algorithm. Leverage approach was applied to determine Applicability Domain (AD) of the obtained models. Results: Three models were developed. 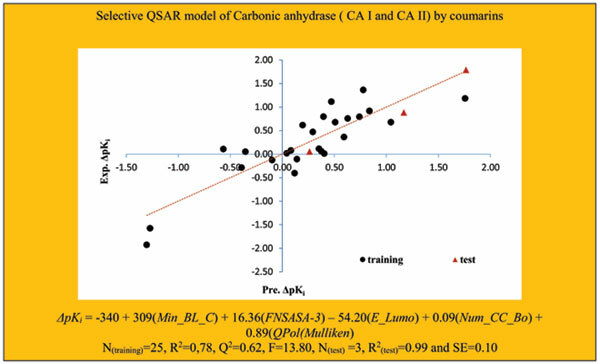 The first model, CAI_model1 comprises 30/11 training/test compounds with the statistical parameters of R2=0.85, Q2=0.77, F=27.57, R2 (test) =0.72. The second one, CAII_model2 comprises 30/12 training/test compounds with the statistical parameters of R2=0.86, Q2=0.78, F=30.27, R2 (test) =0.85. The final model, ΔpKi_model3 consists of 25/3 training/ test compounds with the statistical parameters of R2=0.78, Q2=0.62, F=13.80 and R2(test) =0.99. Conclusion: Interpretation of reactivity-related descriptors such as HOMO-1 and LUMO energies and visual inspection of their maps of orbital electron density leads to a conclusion that the binding free energy of the entire binding process may be modulated by the kinetics of the hydrolyzing step of coumarins. QSAR, Coumarins, Carbonic anhydrase, isozyme selectivity, frontier orbitals, Multiple Linear Regression (MLR), DFT, drug design.